Published: Jan. 16, 2013 at 05:36 p.m. Updated: Jan. 17, 2013 at 01:33 p.m. The corner of the Internet that pays attention to sports stopped all at once around 4:15 p.m. ET on Wednesday. We all had 3,700 words of impeccably reported insanity to read. You know what we're talking about if you've read Deadspin's report regarding Notre Dame linebacker Manti Te'o's supposedly deceased girlfriend. If you haven't read it, we highly recommend doing so. It didn't take long for an official response to emerge. Te'o released a statement that NFL.com and NFL Network obtained Wednesday. "This is incredibly embarrassing to talk about, but over an extended period of time, I developed an emotional relationship with a woman I met online," Te'o said in the statement. "We maintained what I thought to be an authentic relationship by communicating frequently online and on the phone, and I grew to care deeply about her. Notre Dame spokesman Dennis Brown also released a statement, via Facebook. 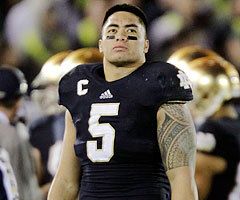 "On Dec. 26, Notre Dame coaches were informed by Manti Te'o and his parents that Manti had been the victim of what appears to be a hoax in which someone using the fictitious name Lennay Kekua apparently ingratiated herself with Manti and then conspired with others to lead him to believe she had tragically died of leukemia," the statement read. "The University immediately initiated an investigation to assist Manti and his family in discovering the motive for and nature of this hoax. "While the proper authorities will continue to investigate this troubling matter, this appears to be, at a minimum, a sad and very cruel deception to entertain its perpetrators." Everything about this story is confusing and hard to put into context: How "Kekua" and Te'o met, the reporting of their relationship and everything that has happened since. Read Deadspin's account and read the two statements. There are many confusing aspects to the story that deserve explanation before judgments can be made. Decide what you think. Meanwhile, we'll be waiting for more information to come out. Te'o is entering the NFL draft in April. He is expected to be at the NFL Scouting Combine in February, which might be the next time we hear from him in a public interview setting. This story isn't going away anytime soon.